When I was 18 years old me and my buddies were in a restaurant in Minneapolis that got a visit by the outlaw bikers gang Satan’s Choice. I was physically ejected from the men’s room by a grizzly biker named Spike. I guess he didn’t like me staring in pale face shock as his “motorcycle momma”, who came in with him, mounted the sink and relieved herself. Aside from being scared half to death at the time, I will never forget the dotted line tattooed across his neck. It read, “Cut on dotted line”. I remember deciding at the time that a person’s IQ might be able to be measured as an inverse proportion to their number of tattoos. I am quite sure that since then Spike probably died a gruesome death when some rival biker took the invitation too seriously. 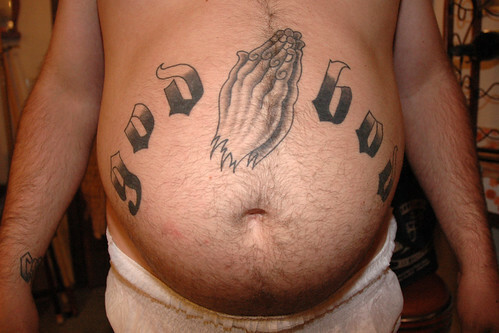 It is not hard to see the tattoo functioning as a self-fulfilling prophecy. I am aware that on the subject of tattoos I may get seriously flamed here. 51% of young people now sport a tattoo and the trend has gotten so out of hand that some have guarranteed that the only job they will ever get is as a model for Ripley’s Believe It or Not. My big concern is the way Christian youths are getting into the act like their very salvation depends on it. Alright, let’s go there. God gave Israel these laws having just come out of Egypt. Egypt was a religious culture that served all kinds of pagan gods. Two of the ways they honoured them were to make tattoos on their bodies, as well as cut their hair in a manner in which these gods were depicted. Check out the picture below. Their hair was shaved at the sides. It is the reason orthodox Jews wear the long curl of uncut hair at the sides of their heads. It’s quite simple, wearing a mullet is an abomination to God. Billy Ray Cyrus is going straight to hell. 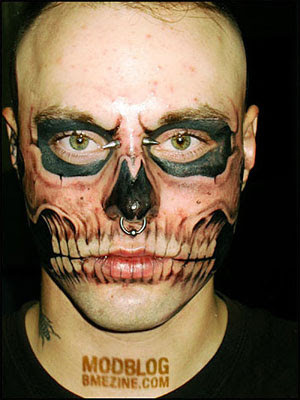 My feeling is that tattoos have become the “tribal marks” of youth culture. A way to feel connected with the times. They provide a sense of cultural belonging not unlike how the ‘baby boomers’ fought tooth and nail with their parents over the issue of growing their hair long in the 60’s. The difference of course is, when the 60’s were over you could always cut your hair. The problem with the tattoo of that ‘soaring eagle’ on you arm, is eventually it is going to look like a ‘sulking chicken’. 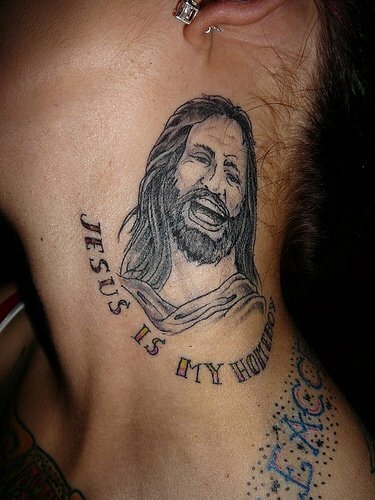 In an attempt to make a statement, some are sporting artwork that screams, “I am just plain stupid”. Literally! 1 Cor 3: 16-17 says, “Do you not know that you are the temple of God and that the Spirit of God dwells in you? If anyone defiles the temple of God, God will destroy him. For the temple of God is holy, which temple you are.” Our identity is not with our culture, but rooted in our God. Our very bodies are considered His temple. The study of scripture reveals He is actually offended when we abuse the temple in any number of ways; drugs, alcohol, overeating, sexual immorality and maybe, just maybe, the body art and piercings that have become so ubiquitous today.